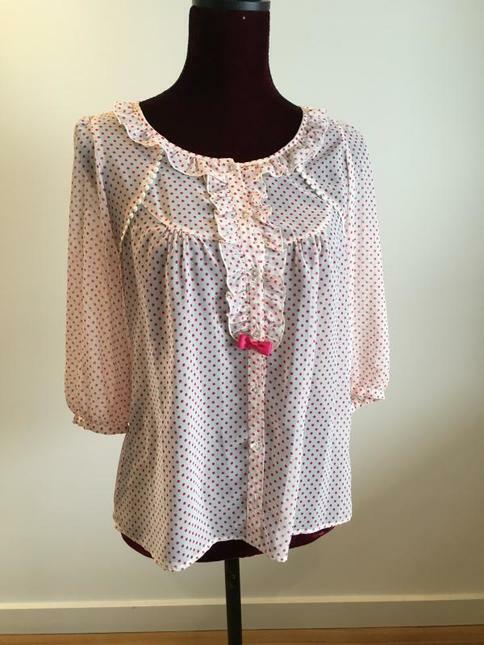 Gorgeous 3/4 length sleeve sheer chiffon blouse from Emily Temple Cute. This blouse has been a staple in my Otome wardrobe! It's super versatile and makes any outfit pop. Super comfortable and lightweight, it is best worn underneath a JSK. The polkadots are a deep pink, though they kinda look a bit red-ish (I have coordinated it with red too without problems). Condition is excellent (no flaws). Seller will not mark down the value of packages for customs purposes. All prices quoted are in USD. You may choose to pay with Australian Dollars using PayPal's current currency conversion rate. Australian buyers will receive their package via Australia Post parcel post.